The light scent of sandalwood and the intricate details carved into each of these wooden fans will lend an air of sophistication to your day! 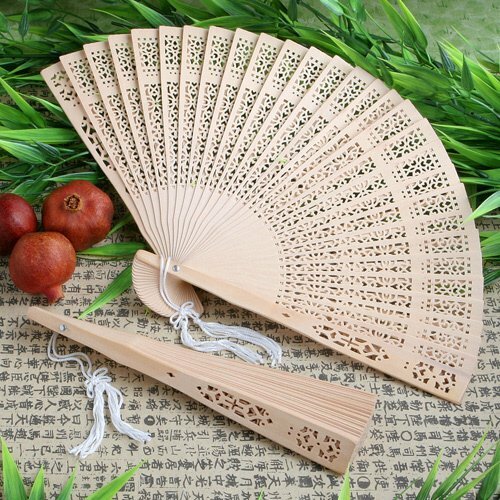 Each of these authentic sandalwood hand fans can be folded out to an 8" by 14" size, and features a delicate white tassel attached to the handle. Intricate carved design on the panels can vary. The natural charm of this unique favor is a wonderful complement to your summer events, outdoor weddings or garden parties and each of our wooden hand fans comes packaged in a white gift box. Can I customise these Wooden Fans - Sandalwood Hand Fan Favors? Hi, I was wondering if we can customize these fans? I need them before July 20th for my wedding. The personalized Sandalwood fan is item #FC-33749. Delivery dates will be provided to you when the item is added to the cart.